Observers in Western Europe can take advantage of the lack of moonlight and deep twilight before local midnight at the beginning of August to seek out the prominent trio of naked-eye stars that comprise the so-called Summer Triangle — Deneb, Vega and Altair. If you can escape the light pollution of towns and cities and give your eyes time to get dark adapted, you may also see the diffuse glow of the Milky Way. This river of stars ensures that the Summer Triangle contains rich pickings for binocular and telescope users. See the accompanying text for detailed information. The five-degree marks on the scale bar equate to the field of view of a 10×50 binocular, while 20 degrees is the span of an outstretched hand at arm’s length. AN illustration by Ade Ashford. If you can find a safe location far removed from the glow of city lights in early August, I invite you to familiarise yourself with some of the prominent naked-eye stars of Northern Hemisphere summer. Sit or lie back in the deepening twilight, keep yourself warm, and initially concentrate your attention on the quadrant of the sky from east to south. As the stars start to come out, the first to catch your eye will almost certainly be dazzling bluish-white Vega nearly overhead. Vega is the brightest star of the constellation Lyra, the Greek harp or lyre. If you direct your gaze about one-and-a-half spans of an outstretched hand at arm’s length below Vega you will encounter a fainter yellowish-white star called Altair, the brightest in the constellation Aquila, the Eagle. Next, look a span of an outstretched hand at arm’s length to the left and slightly below Vega to find another bluish-white star named Deneb, the brightest member of the constellation Cygnus, the Swan. 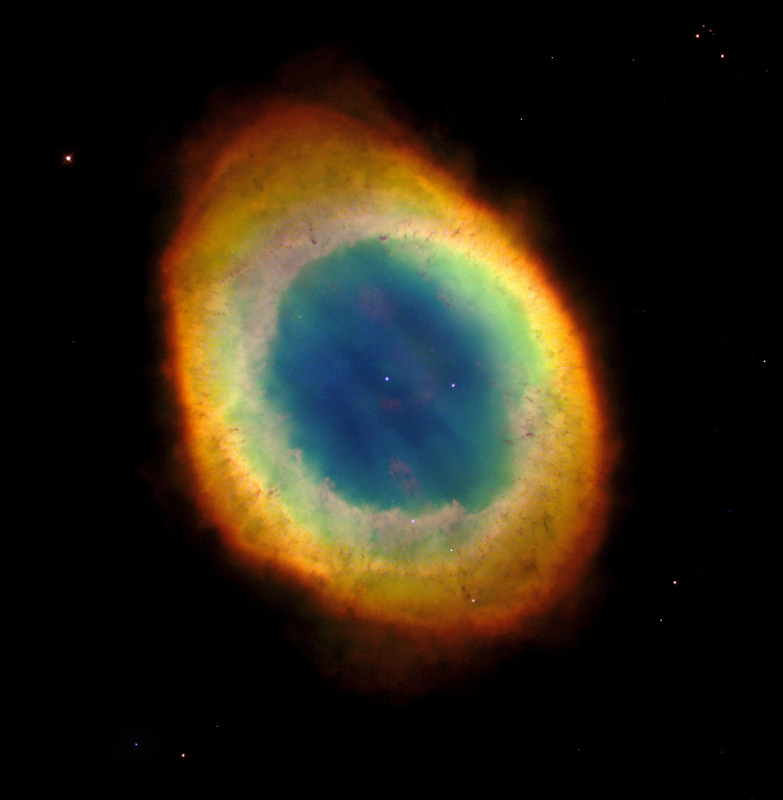 A NASA/ESA Hubble Space Telescope image of the Ring Nebula (M57) in vivid colour. The nebulosity is the expelled outer layers of a former star, now illuminated by the central 16th magnitude white dwarf remnant. A 3-inch (7.6-cm) telescope will show M57, but in larger apertures it looks just like a celestial smoke ring. The nebula is about a light-year in diameter and is located some 2,000 light-years from Earth in the constellation Lyra. Image credit: NASA/STScI/AURA. The celestial trio of Vega, Altair and Deneb (in order of decreasing brightness) form the Summer Triangle, a prominent trio of stars that belong to three separate constellations, but collectively form what is known as an asterism. Incidentally, the stars of any given constellation or asterism are not physically associated with one another: they exist in space at widely differing distances from Earth, but just happen to lie in the same line of sight. Vega, close to magnitude zero on the stellar brightness scale, has a diameter nearly three times that of the Sun and spins on its axis in a period of about 12½ hours (the Sun rotates once in 25 days). Vega is around 450 million years old, 52 times the luminosity of the Sun and 25 light-years away, so the light we currently see from the star set out on its long journey to Earth about 1991. Magnitude +0.76 Altair is half as bright as Vega as seen from Earth. In common with the Sun and Vega, Altair is a main-sequence dwarf star. If you thought Vega was a fast spinner, Altair completes a revolution in about 9 hours! Altair is about 630 million years old, slightly less than twice the diameter of our Sun and almost 11 times as luminous. It lies 16.7 light-years distant, so the light we perceive now left the star around the turn of the current millennium. At magnitude +1.25, Deneb is a full three times fainter than Vega as seen from Earth, but that is on account of its remoteness. Distance estimates to Deneb vary greatly, but it is likely between 1,550 and 2,600 light-years from Earth. It is a white supergiant 200 times the diameter of our star, a celestial beacon up to 200,000 times more luminous than the Sun. If it were as far away as Vega, Deneb would cast shadows at night and would be visible by day! Given that the Milky Way provides such a rich backdrop to the Summer Triangle, it is perhaps not surprising that this region is home to a plethora of double stars, star clusters, and diffuse nebulae – enough to provide a lifetime’s scrutiny with binoculars and a telescope. 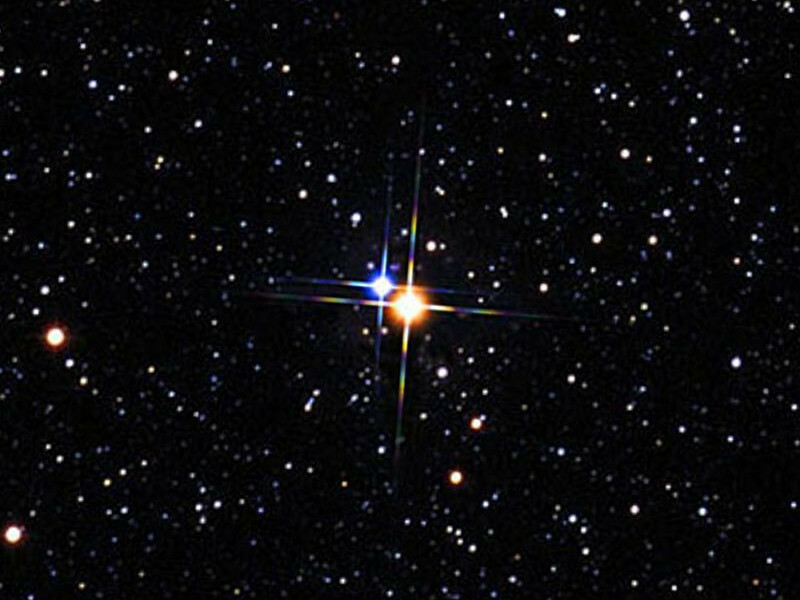 One object you can’t miss an opportunity to see is the easy double star beta (β) Cygni, commonly known as Albireo, with its beautifully contrasting colours. Albireo is an unmissable double star for small telescopes that has glorious amber and sapphire components. It lies at the heart of the Summer Triangle. Image credit: Palomar Observatory/STScI/WikiSky.org CC-BY-SA. Albireo lies at the heart of the Summer Triangle, a third-magnitude star to the naked eye that sits just to the left of the mid-point of a line drawn between Vega and Altair. In the smallest telescope at 30× magnification or more it reveals glorious amber and sapphire components set against the ‘diamonds on velvet’ effect of the Cygnus Star Cloud. Albireo lies about 380 light-years from Earth. If Albireo whets your appetite for double stars and you fancy something more challenging, look no further than epsilon (ε) Lyrae – the celebrated “double-double” just three lunar diameters to the upper left of Vega. Binoculars are sufficient to resolve the pairs, but each component is double again at 200× magnification or more in a 4-inch (10-cm) aperture telescope or larger. While you are in the vicinity of epsilon Lyrae, head south by just seven degrees where you will find two third-magnitude stars separated by four lunar diameters – gamma (γ) Lyrae (aka Sulafat) and beta (β) Lyrae (Sheliak). Between these two stars lies the beautiful Ring Nebula, M57, a tiny celestial smoke ring as seen in 3-inch (7.6-cm) telescopes and larger. 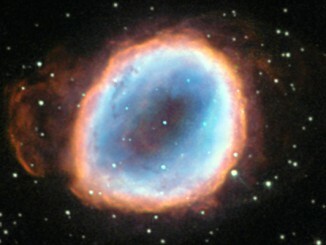 A so-called planetary nebula, it is the expelled outer layers of an ancient star. 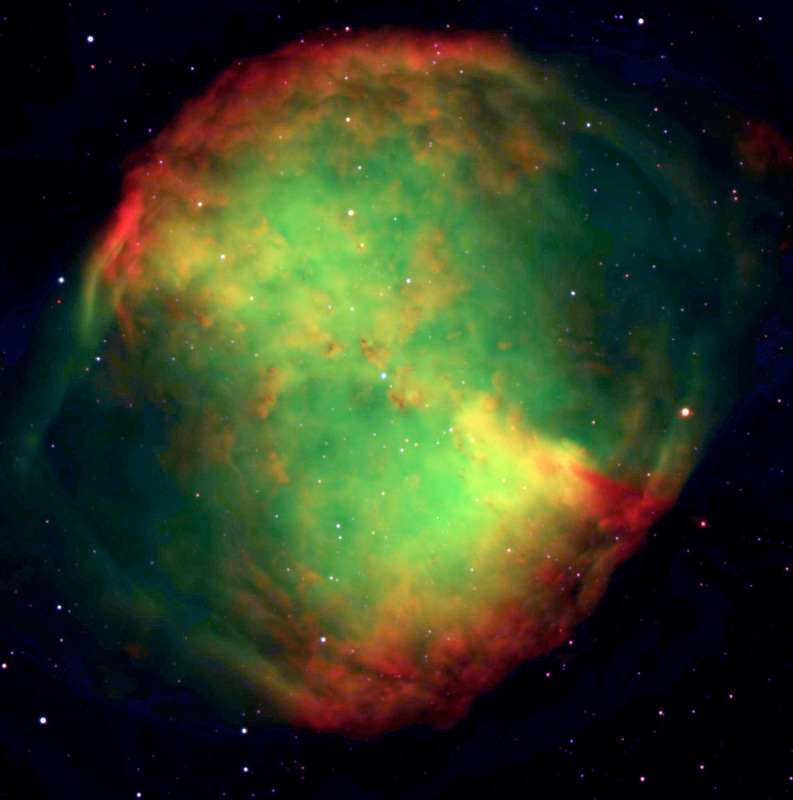 If you find that planetary nebulae are your thing, you can find the Dumbbell Nebula, M27, some 8½ degrees – almost the span of a fist at arm’s length – to the lower left of Albireo. Brighter and larger than the Ring Nebula, M27 is a show piece object of the Northern Hemisphere summer sky with a rich Milky Way backdrop. Having had a taster of the celestial wonders to behold within the confines of the Summer Triangle, perhaps you would like to photograph the area for posterity? Given the 40×25 degree extent of the asterism, if you own a typical cropped sensor (APS-C-type) DSLR, a lens with a focal length of 25mm or less will encompass the three stars. For a full-frame DSLR, a lens of up to 40mm focal length would be fine. Mounted on a tripod, focused to infinity (you may need to use magnified live view on the camera’s screen to refine focus on a bright star) and set to ISO800–1600, exposures of about 20 seconds will record all the stars you can see with the naked eye. If you have a telescope with a tracking mount, piggy-back your DSLR with lens for exposures of up to five minutes to record the Milky Way and pinkish glow of the many emission nebulae that lie therein. 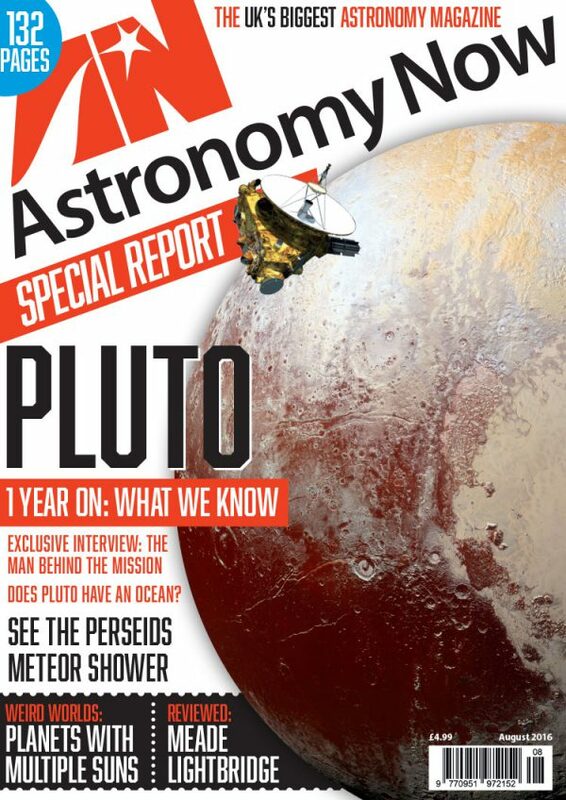 For a comprehensive guide to what is happening in the sky for the month ahead, obtain a copy of the August 2016 edition of Astronomy Now. 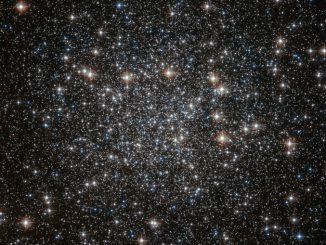 Located some 22,000 light-years away in the southern constellation of Musca (The Fly), this tightly packed collection of stars — known as a globular cluster — goes by the name of NGC 4833. Globular clusters are thought to contain some of the oldest stars in our galaxy. This NASA/ESA Hubble Space Telescope image shows the dazzling stellar group in all its glory. 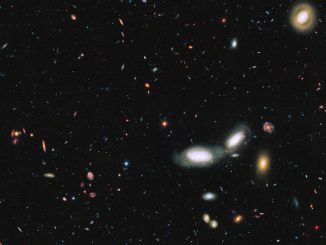 Astronomers using data from the NASA/ESA Hubble Space Telescope and other observatories have performed an accurate census of the number of galaxies in the universe. The researchers came to the surprising conclusion that the observable universe contains at least two trillion galaxies. The results also help solve an ancient astronomical paradox — why is the sky dark at night? A dying star’s final moments are captured in this image of planetary nebula NGC 6565 in Sagittarius from the NASA/ESA Hubble Space Telescope. The death throes of this star may only last mere moments on a cosmological timescale, but this star’s demise is still quite lengthy by our standards, lasting tens of thousands of years.